Tomlin's bold move came in the Steelers-Packers game itself, which has been parsed a thousand times over since Sunday when both teams won their respective championship games. The game was one of the most entertaining of 2009, and Tomlin himself was the reason. 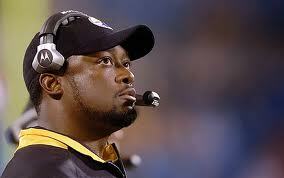 Just having scored to take a 2-point lead in the 4th quarter, Tomlin called for a surprise onside kick. It was unsuccessful and recovered by the Packers, who went on to take the lead themselves. But this was one of the best examples of why the surprise onside kick is such an under-appreciated tactic, because the Steelers went on to steal a 37-36 win. What's most interesting to me is that a failed onside kick is hardly certain death--a 0.42 WP. There was plenty of time for anything to happen--a stop, a turnover, or a score. And sure enough the Steelers gave up a touchdown but came back with one of their own. Also, a successful onside recovery doesn't seal the game. The Steelers would still need at least two first downs to clinch the win. Essentially, the Steelers traded 30 yards of field position for the chance to keep the ball out of the Packers' hands. Let's hope next weekend's game is as fun to watch. "Let's hope next weekend's game is as fun to watch." Fat chance. I bet the coaches get ultraconservative to avoid being blamed for losing the Bowl game by mainstream media and the fans. McCarthy did pretty much everything in his power to ensure that the Bears have ample scoring opportunities in the Championship game. I still can't believe that punting frenzy. 30 something yards from the end zone and neither team goes for it. Tomlin did something similar in the AFCC, if not as unusual, by throwing on 3rd down after the Jets had called all of their timeouts. I agree that the Super Bowl will be boring, but its because the Packers and Steelers offenses can both be easily stopped by the opposing defenses. Should be a good game for coaching tactics tho. Jussi, I doubt Tomlin will go ultraconservative. He already has a track record of being a terrific risk taker, and he has *the* safest coaching job in the NFL, with the possible exception of Bill Belichick. McCarthy, however, may be way too conservative. Punting AND prevents-you-from-winning defense that allowed the Bears to get within a score with plenty of time on the clock?? gimmeabreak. @Jussi, I would be surprised if Tomlin went ultra conservative. One of his staples since taking over is being an excellent game situation coach. As much as it hurts me to say as a Ravens fan, he and Belichick are far and away the two best at understanding what each down means in the greater context of the game. Regarding this onsides kick tactic, I think it would have been well employed by Oregon after tying it up late in the BCS championship game, deliberately allowing Auburn to score a TD quickly if the kick failed and leaving them time to tie it back up.